The Kochs have spent over $88 million in *traceable* funding to groups attacking climate change science, policy and regulation. Of that total, $21 million went to groups that recently bought a full page New York Times advertisement defending ExxonMobil from government investigations into its systematic misrepresentation of climate science. If you're an executive at a big oil company watching as ExxonMobil is finally exposed for studying climate change, covering up the science and spreading misinformation, you're probably worried now that state attorneys general are knocking on Exxon's door. The ringleader group behind the letter, the Competitive Enterprise Institute (CEI), is of particular interest. Exxon dumped CEI for its unsupportable climate stance back in 2006, a crushing blow for the aggressive beltway front group that continued to humiliate CEI staff for years. But it appears that CEI is loyal to the cause of climate denial, despite being abandoned by Exxon a decade ago. Other financiers, like the Koch family and several coal and oil companies may explain why the denial campaign was sustained. Traceable funds only represent a portion of the Koch family’s contributions to CEI. At CEI’s annual fundraising events, Koch Industries’ lobbying subsidiary has been listed as a sponsor. Full-disclosure tax filings published by PR Watch revealed that Koch Industries directly paid Americans for Prosperity, the Texas Public Policy Foundation, and other organizations. PR Watch discovered another revelation in the full-disclosure tax documents that were leaked. Apparently, David Koch likes to cut CEI $100,000 checks straight from his own coffers. David Koch’s money was not sent through his nonprofit foundation, which would have had to report the grants to CEI. This incomplete patchwork of previously-undisclosed funds from Koch Industries and David Koch adds $3,124,834 to the accounting on groups that co-signed the CEI ad. This raises the question: who else is just cutting a direct check to the climate deniers? And then there’s the "Dark Money ATM" sister groups, DonorsTrust and Donors Capital Fund. The DonorsTrust franchise is run by CEI’s former president, Lawson Bader, who helps donors -- including Koch -- anonymize tens of millions of dollars that go to dozens of front groups each year. DonorsTrust & Capital Fund have funneled millions of dark money dollars to CEI. But that's still not the end of the financial trail. Other mechanisms used by Charles Koch and his army of donor friends include Freedom Partners Chamber of Commerce, a dark money umbrella group that has hidden hundreds of millions of dollars in politically-charged cash, shuffled between various trusts, nonprofits, and limited liability corporations. 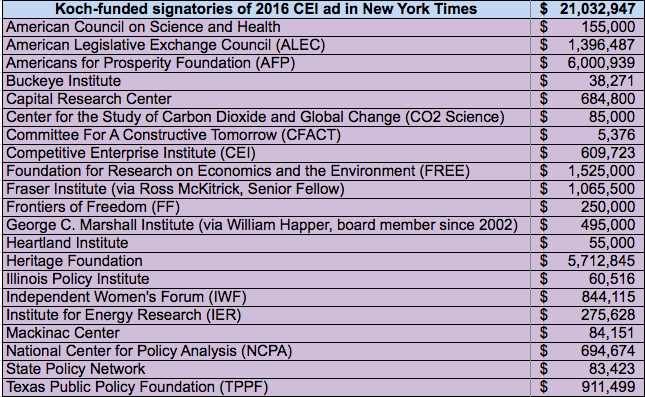 For the deep history, check out Kert Davies' post for the Climate Investigations Center, which spurred my own interest in the sponsors of the recent New York Times ad. Kert details the crucial history of some of the letter’s signatories, the role they have served in the climate denial machine over the years and the exact documents that inform his understanding. 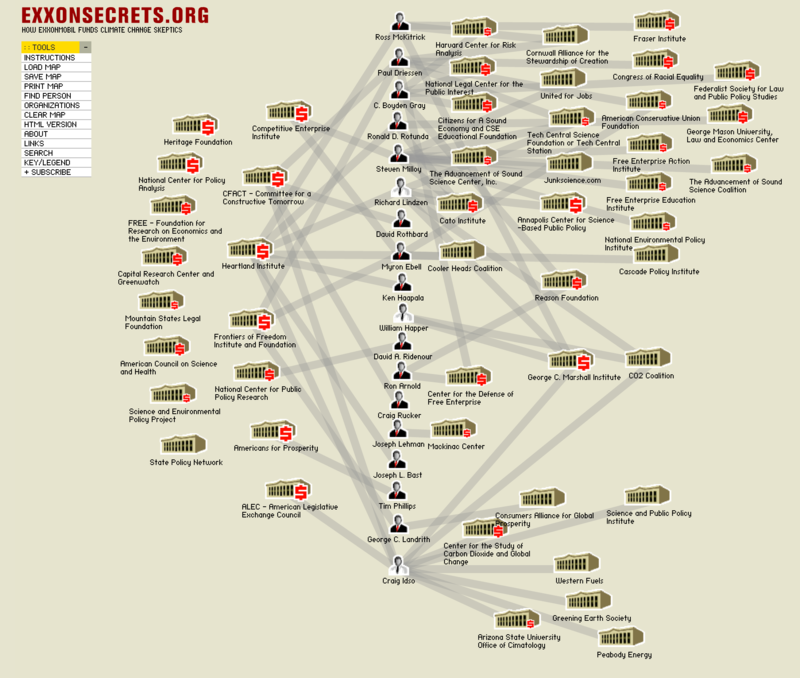 I have reproduced Kert’s ExxonSecrets map (below) of the players involved, as it helps show how a small group of people funded by a few oil and coal companies can cast a shadow that is deceptively deep. The tobacco industry crafted this deceptive model, and fossil fuel companies have innovated it since. It helps that the same people doing tobacco science denial moved on to climate science denial. This indicates that folks like Milloy aren’t just deceiving the public, but themselves. If I was taking Charles Koch’s money to attack science, I too would probably have to constantly remind myself of my American heroics. Mr. Koch is as awkward as ever in his half-hearted attempts to understand climate change science (you'd think a MIT alumnus would get it), he has been wary of climate laws and regulations for a long time. That's probably why he has rained cash on the organizations that stage the fight, groups that have given room for a top U.S. CEO, with a background in chemical engineering, to demonstrate such scientific ignorance. Since 1997, the Kochs have spent more than $88 million in *traceable* dollars into the network of groups that attack climate science, the scientists doing the research, the potential policy solutions and the champions of those policies.